More than £750,000 was raised at a major art auction held as part of Ikon Gallery’s 50th anniversary celebrations. The Artists for Ikon auction, held at Sotheby’s in London, achieved £785,375 by selling works donated by some of today’s most important artists, all of whom have previously exhibited at the Brindleyplace gallery. The proceeds will lay the foundations for Ikon’s 50th Anniversary Endowment Fund, dedicated to the gallery’s artistic programme and the commissioning of new art work. Highlights included works from Birmingham-born artist Hurvin Anderson, Cypress Hill, 2015, and Chinese artist Ding Yi, Appearance of Crosses 2008-38, 2008, which sold for £173,000 and £155,000 respectively. Other top lots included works by artists Beatriz Milhazes (£112,500; O hippie, 2014) and Julian Opie, (£93,750; Red socks and Chanel bag, 2015). A neon work from artist Martin Creed, FRIENDS, 2007, fetched £36,250. Cornelia Parker’s work Alter Ego (Mutiny), 2013 – a reference to her 1988 Ikon installation, Thirty Pieces of Silver – achieved £32,500. Other pieces sold included works from Ian Davenport (£35,000; Colourcade, 2015), François Morellet (£27,500; 12 lignes au hasard hybrides blanc et jaune, 2007), Carmen Herrera (£22,500; Untitled, 2011), George Shaw (£21,250; Nothings Left, 2013-15) Imran Qureshi (£18,750; I want you to stay with me, 2014) Giuseppe Penone (£13,125; Spoglia d’oro su spine d’acacia (bocca), 2001) Elizabeth Magill (£12,500; Unknowns, 2009-15), Bernard Frize (£8,750; Janvier 02, 2007), David Batchelor (£7,250; Colour Chart No 67 (Blue), 20.09.13, 2013) Antony Gormley (£6,000; CONNECT, 2014), Christiane Baumgartner (£3,750; Sanssouci, 2011), Dennis Oppenheim (£3,000; Electric Kiss, 2009) and Amikam Toren (£3,000; Armchair Painting - Untitled (Sea Cow) 1999). 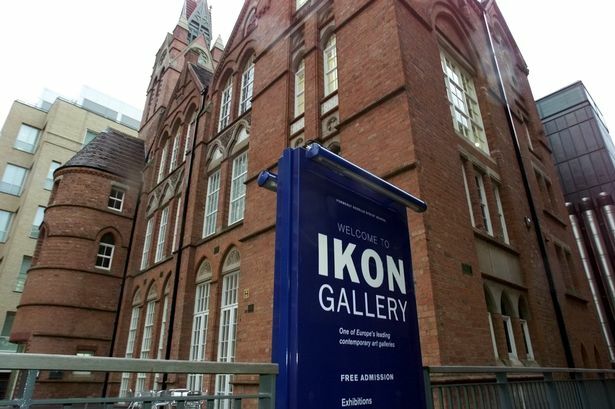 Ikon Gallery director Jonathan Watkins said: “We are delighted to have raised £785,375 so far towards Ikon’s 50th Anniversary Endowment Fund, which will be dedicated to the gallery’s artistic programme and the commissioning of new work. “The buyers have not only invested in contemporary art – vital for the well-being of cultural life in this country – but also made invaluable donations to a charitable cause. The strength of the sales, from artists who have all previously exhibited at Ikon, bears testament to the continuing quality and relevance of our artistic programme since it started 50 years ago. Established in 1964 by a group of artists, Ikon is a registered charity and has grown to become internationally renowned as a champion of contemporary art. It has helped to launch the careers of many famous artists and showcased. The auction was produced in collaboration with Artwise and was supported by Alycidon Capital Limited and Sotheby’s.